Australian robins live with a mate or in small family groups. They usually stay within their territories and do not migrate. They may move to a different altitude, which is usually not far away. Their territories can be as small as 1 acre (0.5 hectare) or as large as 10 acres (4 hectares). The songs of this family are composed of whistling or piping notes. These birds give harsh alarm calls when they feel threatened. Most Australian robins feed by diving from a perch to grab food they spot on the ground. Scrub robins forage on the ground. Generally, this species mates for life. Some species allow helpers to raise the young with them. The female builds a cup-shaped nest in the fork of a tree branch. Bark or lichen (LIE-ken) is often placed over the top of the nest in order to hide it from predators, animals that hunt them for food. 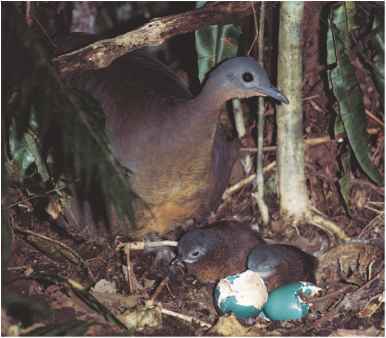 The female lays one to three eggs and incubates them, or sits on them until they hatch, for fifteen to nineteen days, depending on the species. The male of some species will feed the female while she incubates the eggs. The young are fed by the parents for nine to fourteen days; this also varies among species.